Are you getting any business from sending newsletters? For some real estate agents and other small business owners, the answer is yes. They have real ROI (return on investment) proof to show. But for many others, the answer is no—or they’re not sure. Either they’re not getting any business, or they’re not measuring their results. Newsletter ROI can be hard to measure, because there’s not always a direct cause and effect. So before exploring how to improve your print and email newsletters, it’s useful to evaluate what you expect from them and what that means for your content choices. 1. The majority of business owners send newsletters because of FOMO—Fear of Missing Out. They’ve heard that they should send a newsletter. So they do, without any particular purpose other than to keep a minimal level of contact. As far as that goes, it is better than nothing. “Nothing” would mean out of sight, out of mind, so sending a newsletter is better than nothing. If you’re sending newsletters because of FOMO, then any newsletter content will do. It’s likely that if you have low expectations from your newsletters, you’re probably not doing anything to specifically measure results, and it can be hard to tell if they’re working or not. 2. Other business owners send newsletters for the purpose of building industry authority. They expect people to call them for their obvious expertise. There is evidence that heavily “credibility-oriented” newsletters are effective at direct ROI. A newsletter that’s filled with factual data, combined with direct response calls to action will generate direct measurable business. Owners who send these types of newsletters tend to use specific phone numbers or codes to track what articles or items generated specific responses. They also will strive for mailing to many thousands, or tens of thousands of readers. Authority newsletters like these take a lot of personal hands-on to write and design, since the content is highly specific to a location or market segment. For instance, a local real estate agent might show statistics about how home values in a particular neighborhood have been affected by a recent fire or the development of a new shopping center. A carpet cleaner might write about a recent rise in humidity that affects how carpets smell, and encourage people to call for carpet treatment specific to the types of mold spores in the area. If you’re sending authority newsletters, you’re probably getting high ROI…even if you have to spend days writing them (for instance, it takes us 24 to 36 hours to craft one of these newsletters). Many business owners with this kind of focus will hire local freelance newsletter writers, usually starting at around $500/mo. up to $1,500/mo. For some business owners, that’s worthwhile, given their known ROI. 3. A third segment of newsletter expectations is the relationship group. These business owners have an expectation that their newsletters will get enjoyed. They are primarily interested in generating referrals by keeping relationships alive and active. Their calls to action will often specifically ask for referrals. They measure effectiveness based on how many people say they got a copy of their newsletter from so-and-so, or how many referrals they can track back to the newsletters. They gather data by always asking how people heard about them, then tracking back to the source of referrals to find out if the newsletters played a role. At the end of a year, they can say how much money came about as a result of having a newsletter by indicating if the newsletter played a role. The measure can be vague. For instance, you can assign a value, such as 3 for a direct result (“I got your newsletter from so-and-so.”), 2 for a mention (“I read your newsletter, and that made me send it to my cousin who was looking for a house.”), and 1 for a slight connection (“I don’t really read your newsletters, but since you send them, I remember you and that means I sometimes refer you.”). You have to decide how to measure your results in this case. 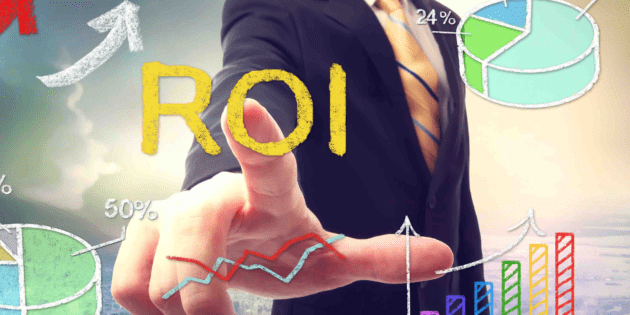 What’s the Point of Measuring Newsletter ROI? The best balance for most small local business owners and real estate agents is to use a relationship newsletter, but to add a little location-specific content. In other words, make the newsletter fun, interesting, and engaging (to keep the relationship alive), but add local content that builds your authority and credibility for the local market.